If you’ve been living under a rock for the past 48 hours you won’t have heard the news about Brunei. The Sultan of Brunei, otherwise known as one of the richest men in the world (imagine Kylie Jenner twenty times over), has passed barbaric legislation is his country to condemn gay men to death by stoning under a law known as ‘Sharia’. The rest of the world have reacted appropriately, calling for a boycott on all hotel properties owned by the homophobic dictator - including London’s Dorchester and 45 Park Lane, as well as hotels in Los Angeles (such as the Beverly Hills Hotel), Paris, Rome and Milan, which are all part of the Dorchester group. 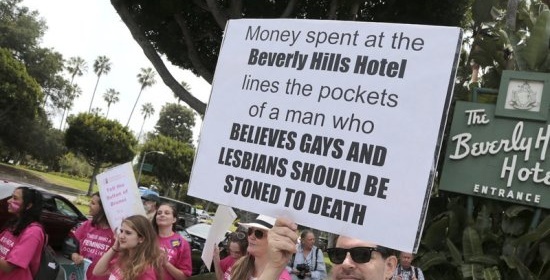 What some people don’t know is that the Sultan of Brunei has been trying to pass this legislation since 2014, where there was a similar boycott putting pressure on the famous Hollywood haunt - The Beverly Hills Hotel - if you watch Keeping up with the Kardashians, you’ll know. The boycott, however short-lived, cost the company millions of dollars. Does this make a dent in the bank account of a man who lives in a palace with 1,800 rooms or drives a solid gold Rolls Royce? Probably not. But should you still do it? Of course you should. Actions such as this are not only morally correct, they successfully raise the profile of the abuse of human rights and make you think twice about where you spend your money. A lot of us are less likely to check in to a Dorchester property than let’s say, one of the Jenner-Kardashian clad, but it’s closer to home than you realise. A great example we saw yesterday was the reaction to the news by The Fellowship for British Hairdressing. As many of you know, the Fellowship have set their annual Luncheon and Awards against the lush backdrop of The Dorchester on Park Lane for many, many years. Regarded by many as one of the most important dates in the hairdressing social calendar, the luncheon celebrates diversity, excellence and progression in our industry, as well as socially acceptable day drinking before 11am. The Fellowship issued a statement announcing that they will this year be hosting their awards elsewhere, in line with their strong code of ethics and in solidarity with fellow human beings. Acts like these, however small, make up for one big change. We applaud the Fellowship, and anyone, from any walk of life, who choses to avoid paying money into businesses like the Brunei Investment Agency which finances violent and murderous regimes.